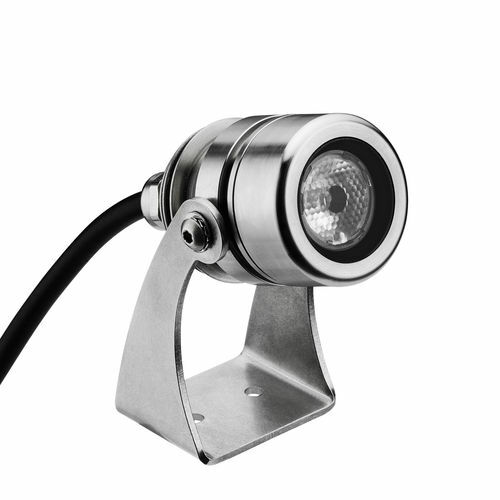 The Sub2 spotlight is suitable for use in water pools and fountains, situations in which the atmosphere created by the beam of light is more important than the power of the source. Thanks to its small size, it can be installed even in small spaces and its presence is completely unobtrusive. Body in 316 stainless steel. Extra-clear safety glass with a thickness of 6mm, ceramic-coated rear. Adjustable from 0° to 135° with bracket, which rotates by 360°. Equipped with 5m connection cable; an extension of up to 30m is available on request. High power LED module on printed circuit board with metal base. Electronic components, dimmable with external dimmer. Highly efficient secondary lens.